Stock photo of historic architectural detail of stone columns and vaulted ceiling at the entrance to the Union Station railway terminal in Downtown Toronto, Ontario, Canada. 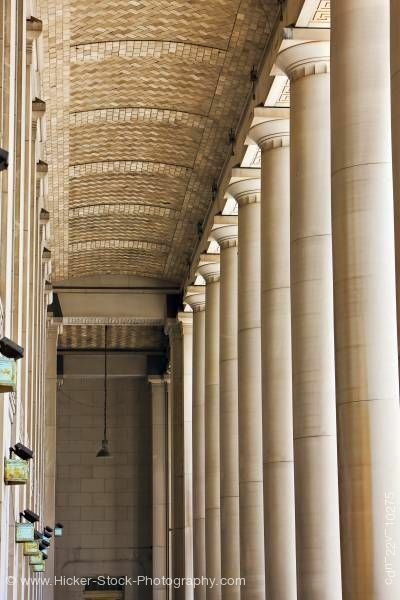 This stock photo is framed by rows of massive columns carved from white stone running parallel toward the entrance to the Union Station railway terminal in downtown Toronto, Ontario, Canada. On the left, blue and green light fixtures suspended from the ceiling hang unlit on long chains at mid-height along the row of columns. On the right, a bit of sunlight shines in from outside the columns. The vaulted stone ceiling supported by the two rows of columns is also decorated in historic architectural detail.